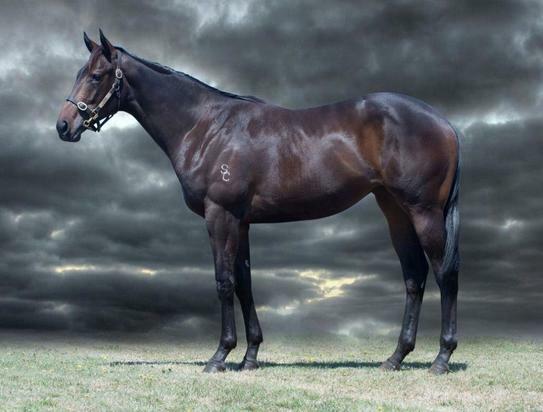 REDOUTE'S CHOICE (AUS) (Bay 1996-Stud 2000). 5 wins-2 at 2, MVRC Manikato S., Gr.1. Champion Aust. Sire 3 times Sire of 1278 rnrs, 963 wnrs, 153 SW, inc. Miss Finland (STC Golden Slipper S., Gr.1), Redoute's Dancer, Stratum, Lankan Rupee, Samantha Miss, Majmu, Fashions Afield, Musir, Nadeem, Mustaaqeem, God's Own, Lotteria, Melito, Wylie Hall, Gallica, King's Rose, Snitzel, Bonaria, Anamato, Howard be Thy Name, Peeping, Royal Descent, Rafeef, etc. Savsbelle, by Savabeel. Placed at 3, A$104,520, 2d AJC Hayai P., 3d VRC Oaks, Gr.1. Half-sister to JUST POLITE (dam of LADIES FIRST), Taiters - Take the Gold (Sing.). This is her third living foal. Dam of two foals to race. LADIES FIRST (Dylan Thomas). 8 wins from 1400m to 2200m, NZ$180,760, to 2017-18, Rangitikei Gold Cup, L, Wanganui Cup, L, Auckland Co-Op Taxis H., Waikato RC SVS Hamilton Cup, Marton JC Rayner Building H., Taranaki RC New Zealand Bloodstock Finance H., NZB Insurance Pearl Series H., 2d ARC Westinghouse Nathan's Memorial H., Taranaki RC Landmark Homes H., 3d Manawatu RC Ricoh H.
Sheahan. 5 wins at 1400m, 1600m, A$149,915, MRC Harrolds H., MVRC Globalgallop.com.au H., 3d Darwin Cup, MRC D'Urban H., Cove Hotel H., Betfair H.
Taiters - Take the Gold (Sing.) (End Sweep). 3 wins-2 at 2-at 1100m, 1200m, Hawkes Bay Speights Juvenile S., Singapore TC Class 5 H., 2d Foxton RC Castletown S., L, 3d Singapore TC Class 4 H., 4th Taranaki 2YO Classic, Gr.3, CJC South Island 2YO S., L, Matamata RC Slipper S., L.
Savsbelle (Savabeel). Placed. See above. Sir Laszlo. 7 wins from 1400m to 2400m, A$173,840, ATC Pro-Ride H., MRC Vale Bart Cummings H., 2d SAJC Moet & Chandon H., 3d VRC Rain Lover H.
Classy Polly. 3 wins at 1600m, CJC Air New Zealand H., Elldridge Lynch H., 2d Ashburton 2YO Classic. Producer. Top of the Range. 3 wins at 1400m, 1600m, A$75,450, to 2017-18, MRC Chef's Hat South Melbourne H., Mitavite Summer Challenge H., 4th BRC Queensland Guineas, Gr.2. High Spirits. 3 wins at 2100m, 3200m to 2017-18, WRC HR Chalmers H.
JUST PLAIN SMART (Pirate's Bounty). 16 wins-5 at 2, Turf Paradise ATBA Sales S. (c&g), L, Prescott Downs Futurity, 2d Prescott Downs Thoroughbred Derby, Prescott Downs Sprint H., 3d Turf Paradise Futurity, L.
No Frills (Never Tabled). 6 wins, 2d Prescott Downs Sprint H., Turf Paradise Susan's Girl H., 3d Turf Paradise Genuine Risk H., L. Producer. Count Remains (Benton Creek). 2 wins-1 at 2-at 5½f, 6f, 2d Turf Paradise Arizona Breeders' Futurity (2YOc&g), L, ATBA Spring Sales Stake Trial, 3d Turf Paradise ATBA Spring Sale S., L, 4th Turf Paradise Arizona Stallion S., L.
STALKING TIGER (Twin Spires). 4 wins-2 at 2-to 6f, US$210,363, Hollywood Park Haggin S., L, 2d Santa Anita Baldwin S., Gr.3, Del Mar Graduation S., L, 3d Santa Anita San Pedro S., L, California Cup Starter Sprint H.
Simply Siber (Siberian Summer). 2 wins at 2, 2d Sam Houston Park Bayou City S., L.